The first stage of the digestion system begins from your mouth.First of all, when you bite into the food(s), your front teeth tears it apart and the back teeth crush and grinds the food.The tongue rolls the food into a ball.Next, saliva that is released from the glands, moisten the the bolus and breaks it into some nutrients.Then, once it reaches the pharynx, the food would go down the esophagus and into the stomach.The digestion system begins from the mouth. The first stage in the digestion system happens in the mouth. First, your front teeth tear the food. Secondly, your back crush then grind the food. Next, your tongue rolls back the food. Then, glands release saliva which turns that food into bolus. Then, the bolus reaches the pharynx and then goes to the esophagus. In the mouth is where the first step of digestion happens. The first stage of the digestion system is the system that gets rid of waste. First, you bite into food your front teeth tear the flesh,then your back teeth crush and grind the food. Your tongue then rolls the bolus back.Glands releases saliva ,which softens and moistens the food,and turns it into bolus. Saliva also breaks the bolus into nutrients. Finally,the bolus goes pass the esophagus. Digestion is how the body throws the waste away. In the first stage of the digestive system food gets to the body.First you bite into the food your front teeth tear it apart and crushes it and the toung rolls the food into bolus and takes it to the back of the throat and the glands release the saliva from the bolus.Second our moths make more saliva and helps soften the bolus and start breaking into nutrients and reaches the pharynx.Finally the bolus enters the esophagus that is a long muscular tube.The food gets to the body in the first stage of the digestive system. The degestive system happens in the first stage. First, you bite into the food. Secondly, your front teeth tear food and your back teeth crush and gring the food. Then, the tongue rolls the food back and the glands releases Saliva and the food tures into bolus. Finally, you swalllow the bolus passes the pharynx that’s in your throat and goes down the esophagus. In the frist stage is where the digesetive system happens. The first part in the digestive system is when food enters and moves down your body. First, you must bite into your food. Next, your front teeth tears up the food allowing your back teeth to crush and grind the food. Then, the food is rolled into a bolus, or ball, by the tongue. 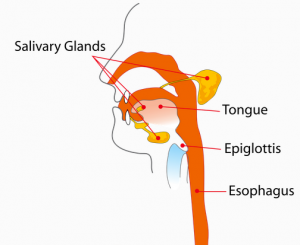 Inside your mouth saliva is produced by glands to soften the bolus. Now, the bolus slides down the esophagus. Food enters your body during the first phase of the digestive system. The first stage of the digestion system begin inside the mouth. First, you have to find something to eat. Second, your front teeth tear the food apart. Then, your back teeth is crushing and grinding all the food. Lastly, your tongue rolls the food into a bolus and it goes into your stomach. Also the gland release the saliva. The digestion system starts in the mouth. The first stage of the digestive system begins in the mouth. First, I bite in to my food, my front teeth tears the food. secondly, when my front teeth are done my back teeth simply just crush and grind the food, now my tongue will roll the bolus back into my throat. Next, salivary glands will produce saliva to make the bolus moist also so that the bolus will break into nutrients. Then the food gets to the pharynx inside of the throat. Finally, the bolus enters into a long muscular tube called the esophagus. In,the mouth is where the first stage of the digestive system begins. The first stage of the digestive system is for the food to enter the body. First, after using the front teeth to tear the food, the food is crushed then ground by the back teeth. Second, the glands release saliva to soften the food, allowing the tongue to mold it into a bolus. Then, the bolus passes the pharynx in the throat and enters a long muscular tube. This is known as the esophagus.Finally, the bolus slips down the esophagus. Food entering the body is the first phase of the digestive system. The first, stage of the digestive system begins in the mouth. First, bite into some food and tear it from your front teeth. Second, use your back teeth to crush or grind the food you ate. Then the tongue rolls food and bolus back and gland release saliva and bolus. Then the bolus enters the esophagus. Finally, when it enters the esophagus it starts to break into nutrients. The digestive system starts in the mouth. The first stage of digestive system is that it has to go to the mouth first then the esophagus. First,the front teeth help the food get teard apart,and the back teeth crush and grind the food. Next the thouge rools back the food and then it gos to the esophagus(if the food gos down the trachea then theres a chance you might chock). Once you take a bit out of eney thing(like food)you start the fist stage of digestive system. In the mouth is where the digestion system starts. First, the front teeth tears up the food and the back teeth crushes and grinds. Next, the tongue rolls the food then gets turned into bolus. The bolus gets soften by the saliva. Finally, the pharyx connects to the mouththen when swallowing the food it goes down the esophogus.The digestion system starts in the mouth. The 1st paragraph is about the digestive system.First,you have to bite into food.Second,the front teeth tear apart the bolus.Third,the back teeth crush and grinds the bolus.Next,the tongue rolls the bolus back.Finaly,the glands releases saliva and bolus.This paragraph is about how you digestive food. Suddenly, I hear footsteps and a little girl picks me up and takes a bite out of me. “Ouch that hurts really bad!” I say while her front teeth tear me and back teeth crush and grind me. Feeling icky saliva is now all over me. Food is not my name anymore it is now bolus. Quickly, I go down a dark tube called the esophagus. Next thing I know I’m in the stomach. Humans cannot live without our digestive system. Food goes through your mouth to the esophagus the digestive system. First, you eat and bite into an apple. Second, with your front teeth bite into it and tear it and your back teeth grind and crush it. Third, your back teeth and tongue roll the food into a ball called bolus. Our mouth produces saliva which helps to moisten and soften the bolus. Bolus then reaches the pharynx in the throat. Fourth a long muscular tube that moves food into the stomach is called esophagus and leads to the stomach. The digestive system is the first stage your food goes through. The first stage of the digestion system begins in your mouth.Whenever you eat your front teeth will tear the food,your back teeth will grind the food,and your tongue rolls the food in a ball called bolus. Saliva is then produced and breaks the bolus into some nutrients. Now the bolus goes down to the pharynx. Quickly, after going down the pharynx the bolus enters a tube that moves food down called esophagus. The digestion systems first stage starts in your mouth.